Sr. Regina Bechtle offers this reflections for Mothers Day… Today’s readings picture a God who shows no partiality, a God who remembers kindness and faithfulness toward us, a God whose truest name is Love – abundant, unconditional, unearned. What a perfect description of a mother’s love! Through times of trouble and confusion this love remains unshaken – God’s love for Jesus, Jesus’ love for the God he called Abba, Jesus’ love for his disciples and friends, theirs for him. A news reporter in 19th- century New York, seeing first-hand the tenderness of the Sisters of Charity for immigrant orphan children, remarked on the “more-than-motherly care” that the Sisters provided. In orphanages, schools, colleges, hospitals, shelters, family service and child care settings, ESL and job-training programs, our Sisters and colleagues have been mothers, mentors, and big sisters for children in need. Reverence for life is more than a slogan; it has been at the heart of our Charity spirit for 195 years and more. A mother’s life is not her own. Elizabeth wrote: “My precious children stick to me like little burrs, they are so fearful of losing me again, the moment I shake one off one side another clings in the opposite, nor can I write one word without some sweet interruption.” Most mothers will recognize the feeling! As she tried to discern whether God was leading her to become a Catholic, her vocation of motherhood remained the center of her life: “The only word I have to say to every question is: I am a mother. Whatever providence awaits me consistent with that plea, I say Amen to it.” Sr. Judith Metz, SC, writes, “Motherhood is a place where she met her grace in a most fulfilling way.” To the community of Sisters of Charity that she founded, she left this maternal legacy of self-giving love and belief in the healing power of loving relationships. The profile of Sister Barbara Ford…summarizes what it means to be a Christian. We find God in our neighbor, and the love for the neighbor tests our love for God. Salvation, the passage from death to life, depends on one’s recognition of God in the neighbor, above all the most needy. This is what Sister Barbara lived and it gave sense to her life….She served unconditionally the poor of Solola and Quiche. She helped them to find health and meaning in their lives even amid great sufferings. She dried the tears of the poor and healed their wounds in a maternal manner. 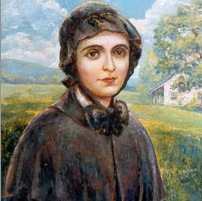 Holy Mary our Mother, Saint Elizabeth Ann Seton, Sister Barbara, all our mothers, here and in the Communion of Saints, pray for us that we may live lives of ove, in the image of our God who is Father and Mother to us, and so much more. Once again, Sr. Regina Bechtle hits it out of the ballpark! Happy Mother’s Day to all who love and nurture God’s children.